Introduction: In previous articles i explained How to pass parameter to stored procedure using SqlDataAdapter and check login in asp.net and Bind gridview using SqlDataAdapter, SqlCommand, DataTable and Stored procedure in Asp.net and Bind gridview using SqlDataAdapter, DataTable and query in Asp.net. 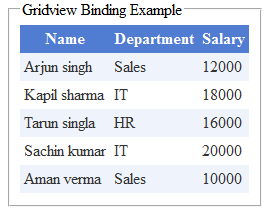 As we know there are number of ways to bind data with gridview in asp.net. Implementation: Let's create a demo web application to see it in action. 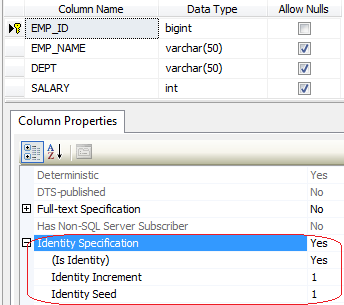 Note: EMP_ID column is set to Primary key and Identity specification is set to yes with Identity increment and Identity seed equal to 1. Insert some data in this table that you want to show in the Gridview.
" I hope you have got How to bind Gridview and If you like my work; you can appreciate by leaving your comments, hitting Facebook like button, following on Google+, Twitter, Linked in and Pinterest, stumbling my posts on stumble upon and subscribing for receiving free updates directly to your inbox . Stay tuned and stay connected for more technical updates."